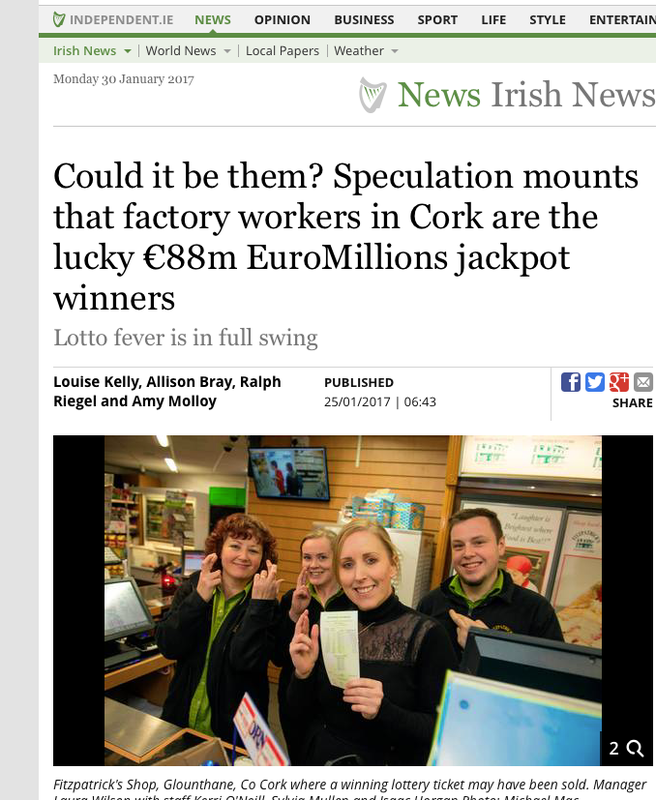 Late in the evening of Friday 20 January there came an announcement that the winning ticket in that night’s Euromillions lottery, worth €88.5 million, had been sold in Ireland. Cue the national hysteria which always follows such announcements. 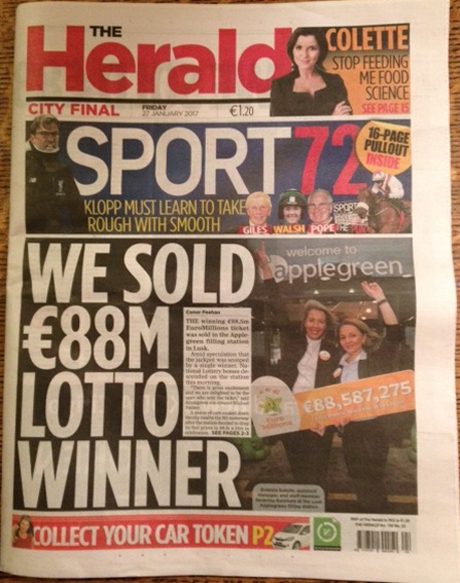 ‘Who has the winning ticket?’ ‘Where was it sold?’ ‘What would you do with the money if you won €88.5 million?’ Journalists were dispatched to all corners of the country briefed to find out the answers to these important questions, and virtually every radio programme and TV news bulletin contained an update. These days, of course, there is another player in the market, ‘social media’, and this fed the rumour mill. Before long, word had spread that the ticket had been sold in Cork, in particular in the village of Glounthane, and even more specifically in Fitzgerald’s shop. ‘Everyone’ knew that this was the case, and even ‘the dogs on the street’ had found out that the winners were a syndicate based in Janssens Pharmaceuticals on a nearby industrial estate. Cue more hysteria. RTE News had a live feed into the main evening news. The Wednesday morning tabloids ran the story on their front pages and by the afternoon the shop’s owner was telling a chat show that her mother was hoping the publicity might get her a husband. By Thursday morning, the owner’s potential suitors might have been reconsidering. Nothing more had emerged from Cork and the satellite trucks pulled out of downtown Glounthane. Then came rumours that the ticket might have been sold elsewhere in the country, probably in Dublin. And so it proved. First thing on Friday morning the National Lottery told RTE’s Morning Ireland that they would be making an announcement as to which province the ticket had been sold in. But when the spokesperson went live on air, he went further than this and announced the actual shop in which it had been sold – the Applegreen service station on the M1 motorway in Lusk, Co Dublin. More pandemonium. 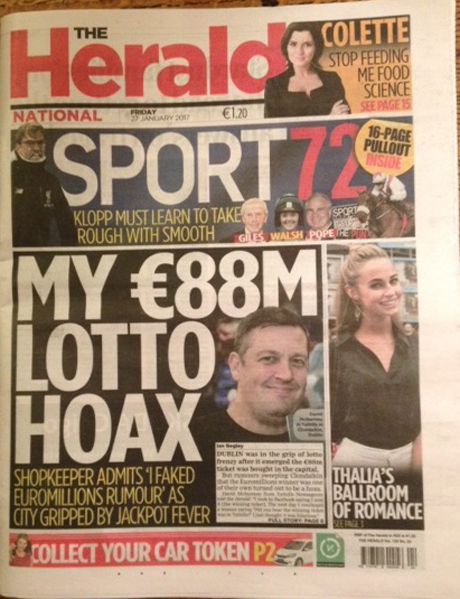 The first ‘National’ edition of Dublin’s ‘evening’ paper, The Herald, had already gone to press. Within hours, The Herald had replaced its front page for the ‘City Final’ edition. Photographers and film crews had descended on the Applegreen service station where the happy staff posed with glasses of Bucks Fizz for pictures. And there was also plenty of publicity for the service station’s decision to drop the price for fuel to 88.5c per litre until stocks ran out. But just who were the lucky winner (or winners)? The Lottery was staying quiet on that, other than confirming they had been in touch with them about collecting their prize. Will there be a concerted drive to find out who they are? Or will their obvious desire for privacy be respected? Time will tell. But if there are any rumours, or false posts on Facebook, then you can be sure that the Great Irish Press will be on the case.